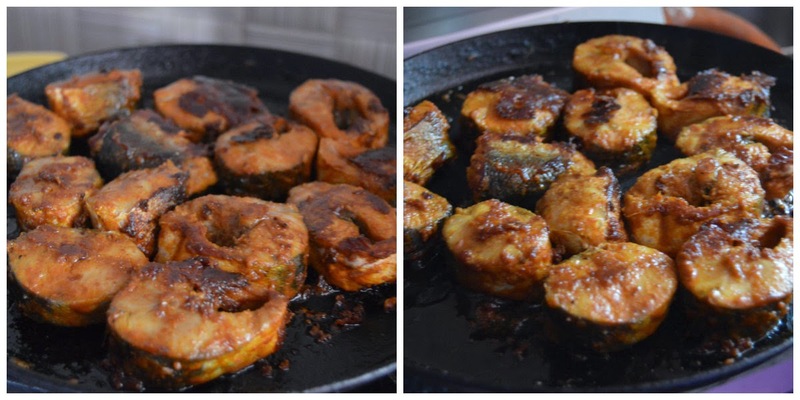 Pavi's Platter: Garfish Fry / Kola Meen Varuval ! 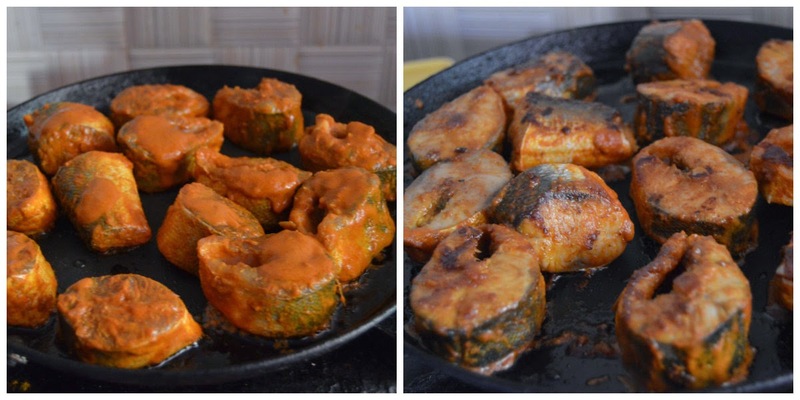 There cant be any nonvegetarian who doesnt love a simple fish fry especially made with fresh fish. 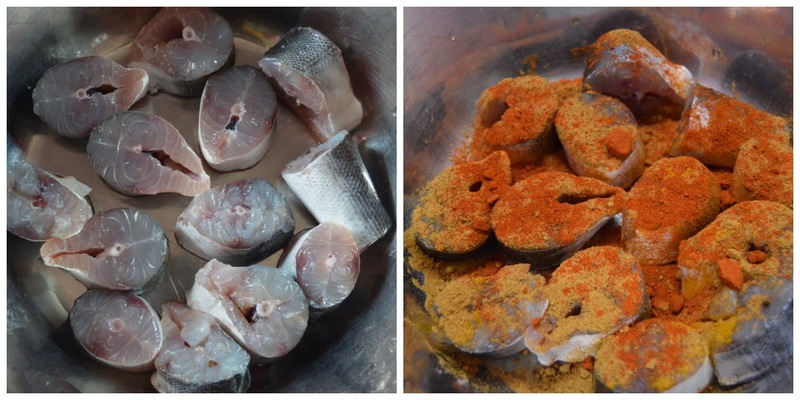 Here in London I don't get to make fish at home and during my last India trip I utilized all my time to blog many fish and other non vegetarian recipes. I got this garfish (kola meen) fresh and it tasted awesome with very minimum spices. I love eating these with hot rasam rice and its definitely this fry and rasam rice is a match made in heaven. Wash the fish pieces well 3 to 4 times in water. We use rock salt to wash the with to remove the dirt. Just use 2 tbsp of rock salt and sprinkle the salt on the fish and rub the salt on the fish with your fingers and then wash it with lots of water. Then add the spice powders and required salt to the fish. 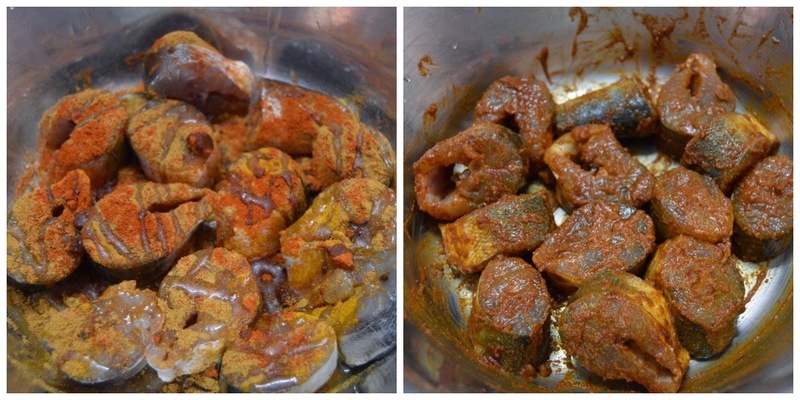 I used homemade chilli powder and raw chilli powder (store bought) along with turmeric and salt as the marinade. The homemade chilli powder already has coriander and cumin seeds in it. So if you dont have this chilli powder, then add a tbsp of coriander powder and 1 tsp cumin powder . Drizzle some cooking oil and squeeze some lemon juice on the fish and mix well. Let the fish marinate in this spices for 15 - 20 minutes. I have not added any water except the lime juice. Some ppl add tamarind juice or paste to it. You can do that as well skipping the lime juice. Heat a tawa and grease it with oil , once the tava is hot place the fish pieces and let them cook for 2 minutes on one side. Keep the flame in medium to prevent the fish from burning. After 2 minutes flip the fish carefully using a spatula and let it cook on the other side for another 2 minutes. As the fish gets cooked it tends to break easily.. especially the ones that are cut very thin. But as i got nice and thick pieces it was easy to flip. You can also close the tava if you have a proper lid to make the fish cook faster. Drizzle some oil around the pieces and Flip the fish again and again without getting burnt till it is cooked well. When you press the fish with a spatula there should be no issssss sound. Means there shouldn't be any water left in the fish and that is an indication that it is cooked. Transfer to a serving plate and serve with onion and lemon wedges.